It was a different era, long before everyone could weigh in on Facebook. Today, there are a few different systems in place, some involving community participation, to name baby animals born at the Buffalo Zoo. Yet in 1994, when Aimee Hilliard was head keeper at the giraffe house, she said the babies were often named in a quick and basic way. After an animal’s birth, the particular keeper in charge would make a gut decision. Typically, Hilliard recalls, each choice had some connection to a continent or place of origin, which was how reticulated giraffes Kalahari and Nairobi got their names. Every now and then there was an exception, including Barbara the giraffe, named at the time for the wife of a longtime keeper. 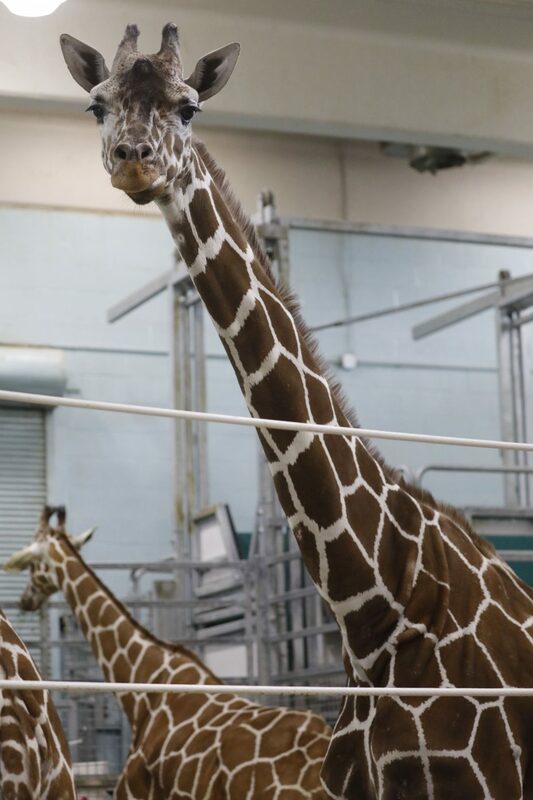 There was also the tale of Agnes, a giraffe believed to have made history for longevity in Buffalo before she was euthanized Thursday, while suffering from both acute arthritis and an infection veterinarians were unable to cure. At 24, at a time when fewer than 9,000 reticulated giraffes are believed to survive in the wild, Agnes may have been the longest-lived giraffe in the history of the Buffalo Zoo and was among the oldest in the nation. According to Joe Hauser, the assistant curator who oversees the zoo’s hoof stock team, the average female reticulated giraffe has a life expectancy of 19 years in captivity. At night, Agnes slept in the same pen as Zuri, a female to which she gave birth four years ago. She was a 16-foot-tall great-grandmother whose progeny now live at zoos around the nation. “She taught a lot of our keepers,” Hauser said, referring to the way astute staff members learn from the animals they manage. Her death touched off a wave of grief, both among the staff and regular guests at the zoo. Many visitors, such as Kathy Campbell of Cheektowaga, made a point of coming to see Agnes after zoo officials told the community Agnes was struggling and would soon be euthanized, an announcement that drew hundreds of reflections on the zoo's Facebook page. “They’re just so soulful,” said Campbell, 61, who carries a giraffe walking stick. Decades ago, she would bring her daughter, Melissa, to see the giraffes at the zoo. They soon became familiar with Agnes, whose presence stretched into an entirely different time in Campbell's life. It was clear in recent months that something was wrong. “She’s getting to be skin and bones,” Campbell said Wednesday, watching as the staff gave Agnes some maple leaves, a favorite treat. During that visit with the five occupants of the giraffe house, Agnes, always attentive, would sometimes swing her head toward Campbell and other visitors. As for the name? Hilliard, the former keeper, left the zoo in 2004, and now works for the state Labor Department in Oswego County. It was a long time ago, but she believes Agnes was born at night to the giraffe called Barbara, and the calf was already there when staff members arrived at work on the morning of Aug. 8, 1994. That was also the birthday of Agnes Tryon, Hilliard’s grandmother, a longtime resident of Niagara Falls who had died less than a year earlier, at 95. Hilliard, in tribute, gave the giraffe the name “Agnes.” Almost a quarter-century later, long after she switched careers, Hilliard was surprised to receive a call from a journalist, telling her the giraffe she named had lived such a long life. Hilliard remembers how Agnes was constantly alert, how she and her companions would hold up their heads in the breeze and notice any nearby disturbance at the zoo – such as the flailing legs of a tortoise that sometimes flipped onto its back. That personality never changed. Hauser said many staff members recall Agnes for her quiet vigilance about consistency, the way she always wanted her surroundings to be exactly the same. She would balk for a moment about re-entering the giraffe house if Hauser so much as left a broom or rake in a spot that was not typical. Rachel Lynn Bowman, a Canisius College student who did an internship with the giraffes, remembers how the other giraffes would not pass Agnes if she paused on her way inside, waiting instead until Agnes was sure everything was where it ought to be. 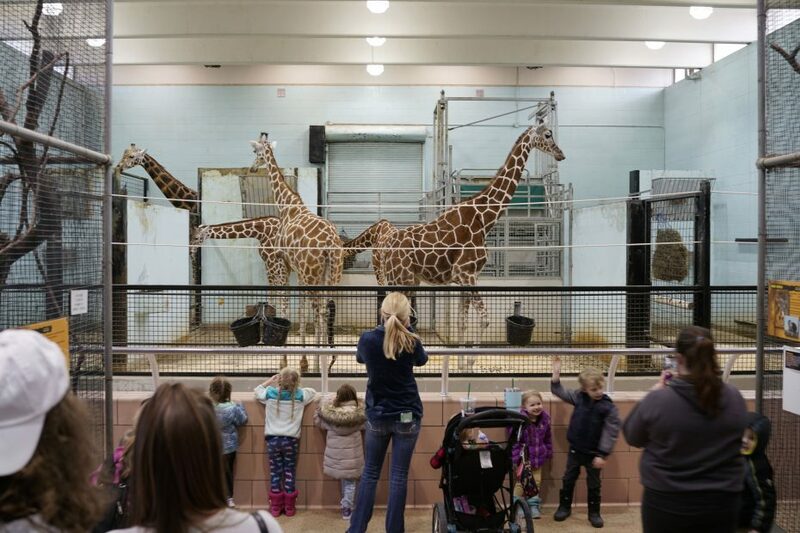 "They're called 'the lookouts of the savanna,'" Bowman said, describing giraffes that in Buffalo spend hours peering over the zoo wall, toward the houses of Parkside Avenue. Seeing them is always a change-the-feeling-of-the-day moment for Zack Garvey, whose wife Cassidy noted on Facebook that her husband often travels past while driving for Safeway Auto Glass. The giraffes, Zack said Friday, seem equally preoccupied with the nonstop traffic. 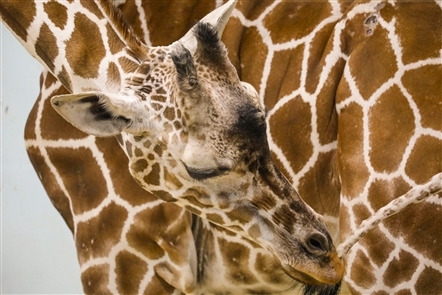 Keesha Bullock, chief communications and marketing officer for the zoo, said the decision to announce that Agnes would soon be euthanized was made at a series of team meetings with the staff closest to the giraffes. They understood what such a long-lived animal can mean to a community, and they wanted people to know the situation. Early in the week, the news brought Chantal Vetter of Holland to the giraffe house. She had spent many hours admiring Agnes and her companions, and Vetter went there for a farewell with her young children – James, Brystol and Brantley – and with Tabitha Jermy, an old friend. 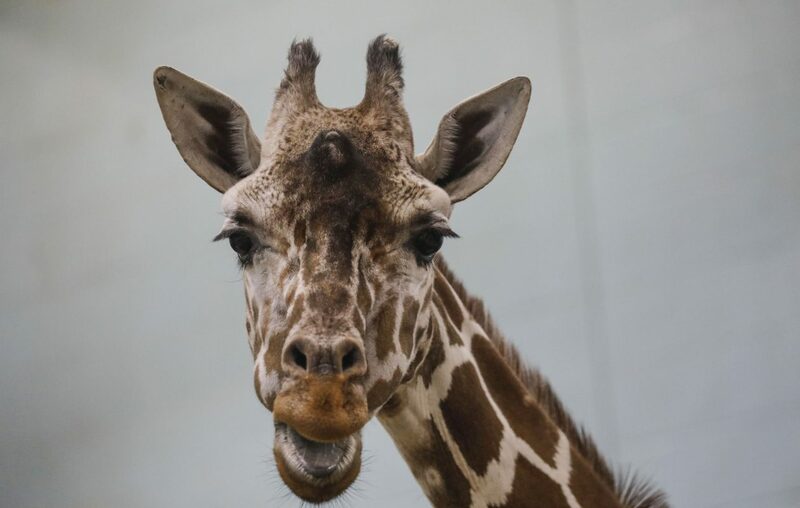 “She was always a free-spirited giraffe,” said Vetter, who visits the zoo dozens of times a year. The giraffes, she said, are "so calm and peaceful and good to each other,” and she said they make her feel better for that example. Kathy Campbell, too, finds peace in such demeanor. She said she has written to the zoo several times, wondering if administrators will someday expand the confines of the 52-year-old giraffe house and its grounds to give the animals more room to wander, a step she sees as the best of all ways to honor Agnes. While Bullock said it is too early to answer that question, she said the zoo is in the middle of shaping a new strategic plan, and giraffes will remain a part of the zoo as it evolves. That means, if you think the giraffes should have more space, this is a good time to write and make that point. As for Campbell, she prepared Friday to return to the zoo for the first time since Agnes died. Animals have their own instincts, perceptions and imperatives, and she did not want to fall into the trap of projecting human emotions onto another species. Still, she appreciated Agnes for the gentle way she lived her life, and she knows the giraffe spent much of her time – including every night, side-by-side in the same pen - with Zuri, the young giraffe born to Agnes four years ago. Considering the nature of the animals, Campbell keeps asking herself the same question. She wonders “how much the baby will miss her,” amid lookouts aware of anything not in its place.